General Hospital (GH) spoilers tease that Sam (Kelly Monaco) will have a lot on her mind. She recently went through a traumatic ordeal with Jason (Steve Burton) and it brought her true feelings to the surface. Sam knew she wasn’t supposed to be pouring her heart out like that, but she just couldn’t contain her love for Jason. She admitted that she doesn’t know what to do. Jason insisted that they know they love each other and if that’s all this can be, it’s enough for him. Will it be enough for Sam though? She may begin to wonder if she can really live without Jason by her side. Sam often runs into Jason around town and she’s co-parenting with him, but it’s not the same. It’s heartbreaking for her to think of never being with Jason romantically again. Naturally, Sam still has plenty of love left for Drew (Billy Miller). That could make it incredibly difficult to walk away. Sam has repeatedly promised Drew that she’s devoted to him. She even married Drew once she realized their previous union was invalid. Sam could’ve backed off and weighed her options, but she felt the need to stand by her current man. Despite her love confession to Jason, Sam may decide to stick with Drew. The truth about her feelings will inevitably come out, but Sam might tell Drew that she’s still committed to their future together. 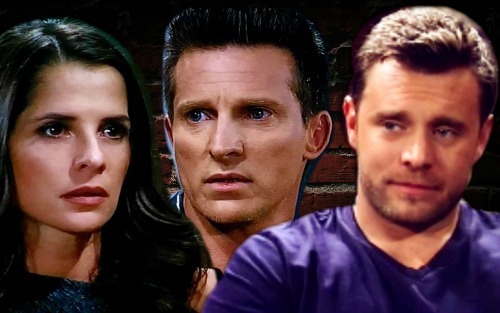 However, General Hospital spoilers say Drew will know that Sam’s longing for Jason. Can he really stand by and watch her make this sacrifice? Drew may decide to put Sam first and step aside. Sam would likely protest, but Drew might feel that a breakup is necessary. Part of him should be hurt, but another part of him will probably just want Sam to be happy. Drew could gently free Sam to be with the man she really wants. Of course, Sam may eventually find that Jason isn’t who she wants after all. There’s no guarantee their GH reunion would be everything they’ve built it up to be. Nevertheless, Drew might give them a chance to see for themselves. It’s the only way Sam can know for sure. Do you think Drew will be the one to bail on this marriage? Will he push for a divorce so Sam can follow her heart? We’ll give you updates as other General Hospital news comes in. Stay tuned to ABC’s GH and don’t forget to check CDL often for the latest General Hospital spoilers, updates and news.